Home / Sci-tech / Have astronomers found a moon in another solar system? This potential new moon orbits a giant, Jupiter-sized planet about 8,000 light-years from Earth. The planet located outside our solar system is called exoplanet and its moon, that is, the satellite is called "exomoon". In the Kepler exoplanet catalog, there are only a few Jupiter-size planets that are farther from their star than Earth is from the sun - good candidates for moons due to the distance. Astronomers Alex Teachey and David Kipping set out to hunt for exomoons using the Kepler space telescope, and analysed the data of 284 exoplanets discovered by Kepler. However, given that both the planet and its potential moon are gas giants, no one is suggesting conditions that might support life. Plenty of planets exist beyond our solar system, but a moon around one of those worlds has yet to be confirmed. 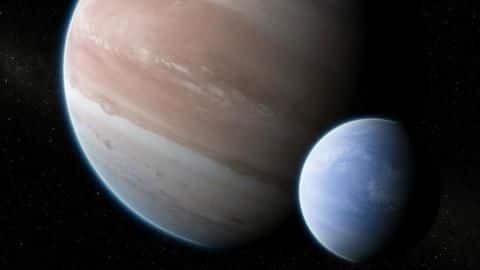 According to the recent study, the object orbiting Kepler-1625b might indeed be an exomoon as the giant planet passed before its host star one hour before the astronomers predicted. This occurs when the exoplanet passes in front of the star, and the method is therefore called the "transit method". All of this makes sense if a huge Neptune-sized moon is orbiting Kepler 1625b. The exomoon is exponentially larger than our solar system's biggest moon. Astronomers have had success locating exoplanets around stars outside our solar system, but exomoons are harder to pinpoint due to their smaller size. They watched the planet during its 19-hour transit. In an attempt to confirm their original tentative detection, the team behind the new study scheduled high precision measurements of Kepler-1625 with the Hubble Space Telescope, which were carried out in October 2017. And finding future moons will require looking at planets much further out from their stars, something that is hard now, but should possible once the powerful but long-delayed James Webb Space Telescope finally begins scanning the skies. They were hoping to find a moon that was the size of Jupiter's large moons, and then requested for a more detailed observation with the Hubble telescope. The ideal candidate planets hosting moons are in wide orbits, with long and infrequent transit times. "Furthermore, the size we've calculated for this moon, about the size of Neptune, has hardly been anticipated and so that, too, is reason to be careful here". On the other hand, the scientists agreed that another planet in Kepler-1625b's vicinity might also cause such turbulence. What did he mean by that? The U.S. -Mexico-Canada Agreement, as the new Nafta is known, still needs to be ratified by the U.S. The Retail Council of Canada said the deal will protect retailers against a "massive change in the competitive landscape". Today's petrol price in state capital Raipur was Rs 84.33 litre and diesel price was Rs 81.21 per litre. The prices of petrol are maximum across the state, soaring above Rs 91 in many districts of the state. Comedian Amy Schumer and model Emily Ratajkowski were among 302 people held for demonstrating against the nominee. For the procedural vote , Flake, Collins, and Manchin voted yes, while Murkowski voted no Friday morning. The Sorrentino brothers were also accused of underreporting their earnings and allocating business funds for personal items. He returned for the program reboot, " Jersey Shore: Family Vacation ", now in its second season. And we'll shoot some stuff and a few days later come back and reshoot it 'cause we wanna take it in another direction". After eight years of playing the Marvel superhero, the actor announced Thursday that he'd performed his last scene. Democrat Joe Manchin voted for cloture , which meant that Vice President Pence did not have to be brought in to break a tie. Senate for voting "YES" to advance the nomination of Judge Brett Kavanaugh!' A second, final vote would need to follow. Kohli put together 133 runs for the fifth wicket with overnight partner Rishabh Pant, who made a quickfire 92. The left-handed batsman stuck around with the lower-order to demolish a toothless West Indian attack. Some more poor play from Lloris saw Messi nearly score soon after as the La Liga giants pushed for a fourth goal. Tottenham No 1 Hugo Lloris was guilty of a huge error in Wednesday's 4-2 Champions League defeat to Barcelona . The company says that it "aims to appeal to a diverse audience, including not only game players but action movie fans as well ". Chernin Entertainment, responsible for the Planet of the Apes series, will be producing it with Masi Oka, of Heroes fame. Police in France have opened an investigation into the disappearance of Interpol president Meng Hongwei. Meng, 64, has been the president of Interpol for nearly two years. "He left Lyon for China last week". S-400 air defence system The focus of the summit will be an agreement on the S-400 air defence missile system. India is expected to receive the first S-400 regiment two years after the signing date of the contract. Kershaw ran out to the mound as though he was going to pitch the ninth, bringing cheers from the sellout crowd of 54,452. Braves starter Anibal Sanchez (0-1) gave up three runs on five hits over 4 2/3 innings with a walk and three strikeouts. In Marvel movies, the archetype of the 2018 superhero movie, the heroes' motives for doing good rarely require much exploration. Anne leaves Eddie, and he's all alone in the world, scraping by with only his neighborhood for company. California-based tech giant Google is all set to launch its latest flagship smartphones Google Pixel 3 and Pixel 3 XL next week. Only after both smartphones have officially been launched, will we know the pricing details of the handsets in India.